I say this because it gives me the chance to work in an environment without the usual time restraints of the wedding day. Working with a couple full of love and emotion and typically very excited about what we are doing. Add these element together and it almost always translates into a very fun and productive photography session. Of course, there are times when we have to work ourselves through someone’s shyness or nervousness about being in front of a camera into the excited phase, but we do usually get there. There are many times when there are outbursts of spontaneous joy and laughter. Fun and laughter aside, the photos obtained from an engagement photography session can be an essential element of your wedding planning. This is evident by the many items that can be created from the photos. There are save-the-date cards, the wedding guest sign-in albums and the table decor for your wedding. There are images to use on your wedding web site and for submitting to newspapers. Photos to include with the invitations and it is not unusual to have one or two included in the final wedding album. Engagement session photos can also be gifts for family and loved ones, portraits of each other and as a couple, and even framed or frame-less portraits to hang in your home. Yet possibly the most advantageous reason to include an engagement photography session in your wedding photography is because it gives the couple and the photographer a chance to work together before your wedding day. From the couple’s point of view, it is the perfect opportunity to interact with their chosen photographer before the day of your wedding. 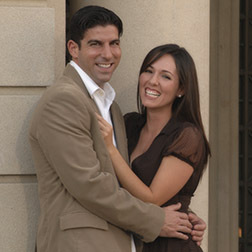 This allows the couple to know what to expect from him or her and how well the photographer is able to work you. This will be apparent in the photographer’s ability to communicate with and give direction to you, both individually and as a couple. It also gives you a firsthand opportunity to see what type of equipment the photographer carries. This includes cameras, lens, lighting, possible a tripod and an appropriate amount of back-up gear. Of even greater importance, how well do they operate it. If you have made the right choice in selecting your wedding photographer, this opportunity to engage in this photo session with him or her, should alleviate any fears or apprehensions you might have. From the professional photographer’s point of view, the engagement photo session is a chance to see what you are comfortable with or maybe a little uneasy about. It is also an opportunity to find your best angles and strengths. Although an engagement session is certainly not required to have a successful wedding photographic experience that will yield you beautiful images, it can be extremely beneficial. If you haven’t been there yet, please check out my Engagement Sessions. Plan to do your engagement session sooner as opposed to later. Allow yourself and your photographer sufficient time to select and produce cards, albums, photos, etc that you will need for your wedding. Ask your photographer for tips on what to wear and what to avoid. If your engagement session is an outdoor environment, be aware of the time of day you are being asked to schedule. The best light is usually early morning or an hour or two before sunset. The time of day will vary dependent on the season and weather conditions. If there is a special, meaningful place for the two of you, you might ask your photographer if you can do your photo session there. However, be aware that not all environments look good in photographs. If there are things that the two of you enjoy doing together, consider asking your photographer about incorporating it into your pictures. Engagement sessions are usually casual and fun. Be prepared to have fun.